A stunt revolver used in the first of Christopher Nolans Batman trilogy, Batman Begins. Made of hard rubber, this was one of two pistols made for the scene, taking the place of Waynes hero Taurus revolver so that a real firearm would not be thrown in the water and possibly lost. The thrown pistols were recovered by members of the crew waiting in the river. This heavyweight version is a direct casting of a real Taurus Model 85 and features a silver paint finish with the bullets in the chamber painted in a copper finish and the grip painted with a wood effect. Well used on the production, the prop pistol features some signs of wear but is in an otherwise good production-used condition, and comes presented in a beautiful bespoke display featuring stills from the film, the film's logo, a description of the piece and an opening front panel to allow direct access. Measures 52cm x 38cm x 7cm (20.5" x 15" x 2.75). 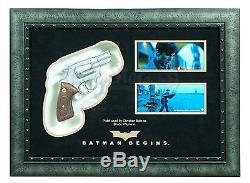 The item "Batman Begins Bruce Wayne's (Christian Bale) Pistol Display" is in sale since Thursday, June 15, 2017. This item is in the category "Entertainment Memorabilia\Movie Memorabilia\Props\Originals". The seller is "speedy-pepper" and is located in Santa Clarita, California. This item can be shipped to United States, United Kingdom, Denmark, Romania, Slovakia, Bulgaria, Czech republic, Finland, Hungary, Latvia, Lithuania, Malta, Estonia, Australia, Greece, Portugal, Cyprus, Slovenia, Japan, China, Sweden, South Korea, Indonesia, South africa, Thailand, Belgium, France, Hong Kong, Ireland, Netherlands, Poland, Spain, Italy, Germany, Austria, Israel, Mexico, New Zealand, Singapore, Switzerland, Norway, Saudi arabia, Ukraine, United arab emirates, Qatar, Kuwait, Bahrain, Croatia, Malaysia, Brazil, Colombia, Panama, Jamaica, Barbados, Bangladesh, Bermuda, Brunei darussalam, Bolivia, Ecuador, Egypt, French guiana, Guernsey, Gibraltar, Guadeloupe, Iceland, Jersey, Jordan, Cambodia, Cayman islands, Liechtenstein, Sri lanka, Luxembourg, Monaco, Macao, Martinique, Maldives, Nicaragua, Oman, Peru, Pakistan, Paraguay, Reunion.